We had three mimosa trees in our front yard at Mama and Daddy’s. The two on either end were somewhat smaller than the middle tree, and for whatever reason, the middle one is the only one we would climb. I LOVED that tree. It was my escape, my hideaway, my “house.” There were two limbs that were sturdy and ran parallel all the way up as high as our roof. I would use them as stairs and hand rail and climb up to the spot where the top branch formed a cradle with three branches–perfect for laying in and reading or dreaming or cloud watching. It was this “room” that was the room of Scarlet Royal Winters, my alter ego, I guess, and the room was “decorated” in red, gold, and white (get it?). I devoured many books up in that tree. 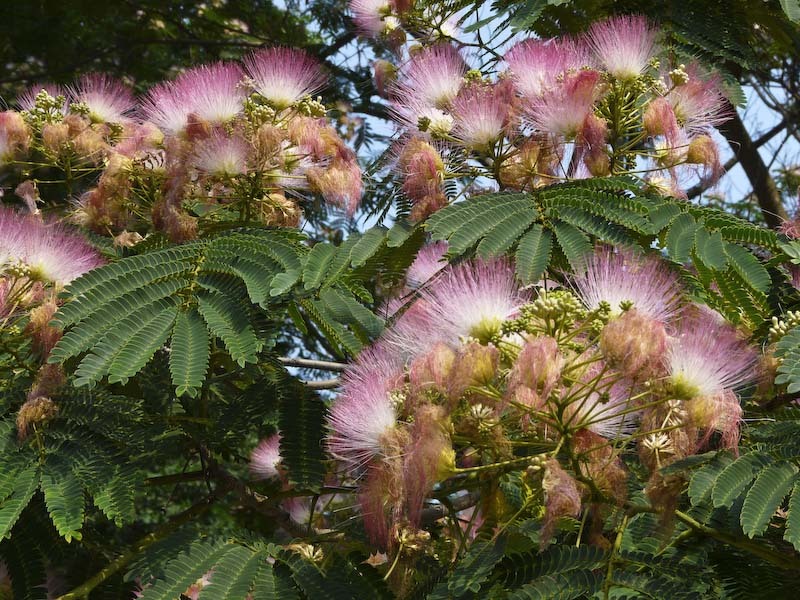 Mimosas are such interesting trees–they have these beautiful pink blossoms that look like they belong on dancers in movies from the 40’s and 50’s. (I’m reminded in this moment of the costumes from the shows in “White Christmas.” Ahhh…..beautiful.) The blossoms hang on until they turn a brownish color (or are picked and put in one’s hair), and then they drop. These trees also drop seed pods. Sometimes the seeds take and little ones grow. I can remember mowing over more than one seedling in my days pushing the mower. We each of us three girls had her own spot in the tree, but mine was the best I was sure. My brother, nine years my junior, was too young to climb, but he had his own interaction with the tree. He had been playing outside, and somehow Mama figured out he had eaten some of the seed pods. (Or maybe just the seeds?) She did her research, which in the days before Google and the internet, was probably calling her doctor or poison control. Yep, her source told her they were toxic and she should administer ipecac syrup as soon as she could. Which she did. Only this special medicine, designed to make the recipient throw up whatever they had ingested, did not work. Mama was concerned. As she tried to figure out what to do next, my little brother, a toddler at the time, climbed on his Sit and Spin–does anyone else remember these?–and went to town on it. As he turned the steering wheel and spun around and around, he got very dizzy, and well, the Sit and Spin did what the ipecac had not. No more seed pods (or anything else) left in him. From then on, we were all in charge of watching him and making sure he didn’t so much as look at the mimosa tree seeds. There’s another thing about mimosas. Probably my favorite thing. (I’m whispering this to you.) They go to sleep at night. It’s almost magical. Isn’t that amazing? No kidding, when the tree’s “brain” detects that the sun is going down, the leaves fold into themselves, showing the underside which appears rather silvery or gray. And then, when the sun begins to rise, they open their faces to the new day once again. Absolutely fascinating. Tonight I am thankful for my little brother and all family lore, but especially the story of The Mimosa Seeds and The Sit and Spin. I can’t wait to share it with his three little guys. I am thankful for whoever planted the mimosas there, because I was the one who got to enjoy them. Thank you. Makes me think an awful lot about what seeds I have planted today. And tonight, in the midst of having a tired body and a weary spirit, I am thankful for the lesson that we are given in nature. When the sun goes down, wrap yourself up and rest. The time to rise will come again in morning. And when we are rested, we can plant seeds that will bring joy to someone else tomorrow or the next day or next year…..and in the present, the gift of a rested spirit is we can smile and share light with those around us. And so the seeds scatter…..and on and on. I made many a crown from mimosa blossoms. Thank you for the sweet memory! You are most welcome. Thank you for reading and taking time to reply…..any chance you wore it while you would sit on your baby brother’s sit and spin and try to make it whir around even though you were way too big to sit on it…..oh wait, no never mind, look away, nothing to see here. 🙂 Thanks for remembering with me. Busted. We didn’t have the money for a Sit and Spin when I was small enough to want one. By the time my cousin got one, I was too big to spin very fast or to wrap my knees around it in the right way. I was CRUSHED (but I still tried!). Hey now, I eventually got big enough to give up the mimosa seed habit and actually climb the tree. I remember walking along the big branches. Love ya! Never enough, never too many.